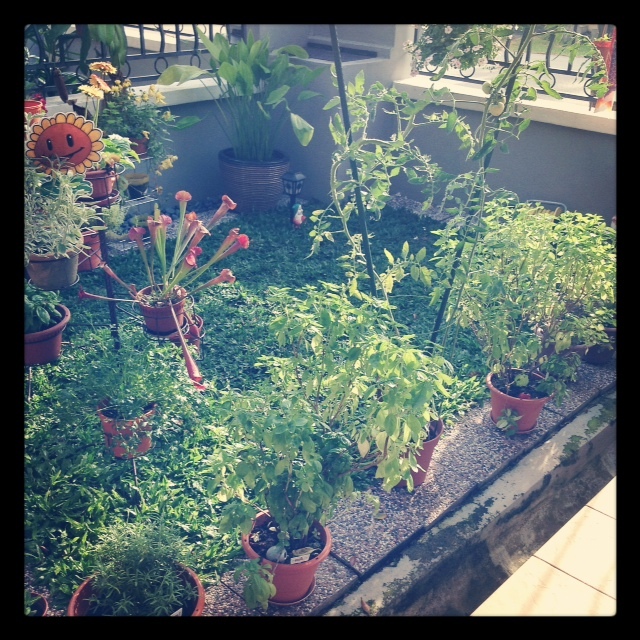 you can see that my true passion lies in edible plants: more precisely herbs. I can still remember my first potted herb: chives. Circa 2007, a Cold Storage had just opened in Malacca, and along with its atas imported food and live, but miserable, lobsters in a tank; it also brought along with it small pots of herbs selling @ RM 4.99. My housemate’s boyfriend, who was then the better cook, had snapped up most of the good stuff — amongst them a pot of Genovese basil — hence why I was stuck with a pot full of chives. Not to be underestimated, though; these resilient tufts have flavoured many a bowl of mashed potatoes for me. Many days of coveting later, a better cook was not necessarily a better gardener — and I mean no offence if you or your wife are reading this, I did call you a better cook — and I was given a handful of basil stalks on the brink of death. We had apparently thought that basil, being associate with Western cooking, was a temperate plant and therefore kept it indoors in an air-conditioned room. Of course I now know that we had thought wrong. Anyways, a few hours of Googling later, and I was equipped with all the necessary knowledge to raise my own herb garden. I’m surprised I didn’t name them. — it is NOTHING like the spinach smelling / tasting junk that that tries to pass off for fresh basil in the supermarket aisles. Let’s not even get started on the dried varieties. People if there is only one herb that you absolutely must grow and harvest fresh, let it be basil. Five years later, I have that for a herb garden. And I have the pleasure of snipping all my herbs fresh for my meals.